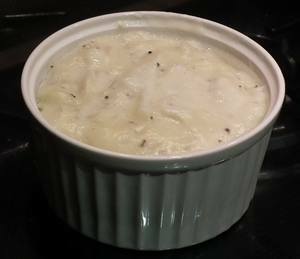 This traditional, easy bread sauce recipe has been popular for many years but by combining it with making onion sauce you can make it very easily and frugally. Bread sauce is almost unknown outside of Britain, which is surprising as it is delicious. Having said that, a bit like Marmite, some people love it and others hate it but very few are neutral! Bread sauce is very easy to make, basically a white sauce thickened with breadcrumbs. The standard method of making it is actually quite wasteful for a dish that is there to stretch the poultry which it normally accompanies. The late Marguerite Patten felt that bread sauce should be served as a light pouring sauce instead of a gravy with chicken for example. But when served much thicker it becomes an accompaniment rather like stuffing that extends the meal, reducing the amount of poultry used. I was quite surprised to find out you can actually buy breadcrumbs, especially seeing that they are so easy to make and keep from stale bread. We all find ourselves with unused bread and it can be used profitably for making your own breadcrumbs. Cut the bread into slices and leave it for a day to go stale If you’re in a hurry you can pop it into a microwave and cook it until it starts to steam. Leave to go cool again and it will be fairly stale. Break it up into small pieces and put into a grinder or liquidiser. Pulse until the bread is broken into crumbs but don’t over do it and turn it to powder. Once made, bag up in 50 gram portion sizes in air-tight plastic bags and freeze until required. Peel and quarter the onion, stud with the whole cloves. Put into a saucepan along with the milk, bay leaf and peppercorns. Bring just to the boil and simmer carefully over a low heat for 10 to 15 minutes. Remove the studded onion and strain the milk through a sieve over the breadcrumbs, adding the seasoning and butter. Mix well. Leave to stand for 5 minutes and either put into the fridge where it will keep for a couple of days or immediately re-heat prior to serving.